What is it? Turmeric is a spice used for its orange-yellow color and flavor. Curcumin is one of several compounds found in turmeric (called curcuminoids) which gives turmeric its color and antioxidant and anti-inflammatory properties, making turmeric powders and extracts useful as dietary supplements (see What It Is). What does it do? Small clinical studies suggest that curcumin from turmeric is helpful for indigestion, ulcerative colitis, rheumatoid arthritis and osteoarthritis, seasonal allergies and depression. Other compounds may also be active. (See What It Does). How much to take? The typical daily dose ranges from 500 mg to 2,000 mg of curcuminoids (most of which is curcumin) from turmeric extracts (see Dosage), which can often be as much as 95% curcuminoids. Turmeric powder is also in some supplements and is similar to turmeric spice, which is only about 3% curcuminoids, i.e., one teaspoon provides about 5,000 mg of turmeric, or 150 mg of curcuminoids). Best turmeric/curcumin supplement? As shown in Results Table below, two supplements contained only about 50% of the curcuminoids we expected from them. Among supplements which passed testing, we identified our Top Pick for Supplements -- one of which provided curcumin at lowest cost and includes a bioavailability enhancer to boost the amount of curcuminoids making it into your bloodstream (see Absorption and Bioavailability to learn about bioavailability enhancement with CurcuWin, Meriva, BCM-95, and Bioperine from black pepper). It's generally best to take turmeric/curcumin with food containing some fat in order to increase absorption. Best turmeric spice? We also purchased bottles of popular turmeric spices, testing them for heavy metals (lead, cadmium and arsenic) and filth. Due to filth, only 2 of 5 products met our quality criteria and one was chosen as our Top Pick for Spices. To get the most from turmeric spice, use it in a meal which contains fats or oils, as well as some black pepper. Cautions: Turmeric/curcumin supplements are generally safe, but gastrointestinal side effects may occur with higher doses and they can cause problems for people with gallbladder disease, kidney stones, or those taking blood-thinning or blood-sugar-lowering medications. One of the bioavailability enhancers commonly added can potentially affect a number of drugs (See Concerns and Cautions). Turmeric is a spice used commonly as a food coloring, flavoring agent, and is a key ingredient in curry powders and mustards. Turmeric is used in Ayurveda (traditional East Indian medicine) for abdominal ailments and arthritis. The dried, powdered roots (or rhizomes) of the plant, Curcuma longa, are used medicinally. Most research has focused on compounds in turmeric called curcuminoids and, more specifically, on the compound curcumin, which gives turmeric its orange-yellow color and is the predominant curcuminoid in turmeric. The other two curcuminoids in turmeric are demethoxycurcumin and bisdemethoxycurcumin. Many uses of turmeric relate to the anti-oxidant or anti-inflammatory activities of curcumin. The anti-inflammatory action might involve blocking cyclooxygenase-2 (COX-2), the target of non-steroidal anti-inflammatory drugs (NSAIDs) like Celebrex (celecoxib) and Motrin (ibuprofen). A critical analysis of research on curcumin extracts (as opposed to whole turmeric powder or extracts with a broader range of turmeric compounds) by experts in medicinal chemistry suggested that: 1) much of the activity of curcumin in laboratory experiments may be "false" and only due to its interference with tests; 2) regular curcumin lacks features common to useful medicines since it is poorly absorbed and unstable; and 3) several well-controlled clinical studies have failed to show clinical benefits with curcumin (Nelson, J Med Chem 2017). The analysis makes valid points -- studies to-date which have shown benefit have been small — but it avoids discussion of the potential for bioavailability-enhanced curcumin formulations which overcome absorption issues and are now the most commonly used types of curcumin supplements. One well designed study found turmeric powder better than placebo for symptoms of indigestion. In this study, 116 participants took either a placebo or 500 mg of turmeric four times daily for seven days. Eighty-seven (87%) percent of the people who took turmeric reported improvement compared to 53% of the placebo group (Thamlikitkul, J Med Assoc Thai 1981). Curcumin may be helpful for people with ulcerative colitis when taken in addition to standard medication (e.g., mesalamine, also known as 5-ASA), although results appear to vary depending on the curcumin formulation and dosage. In one study, 50 people with mild to moderate ulcerative colitis not responsive to mesalamine were given 1.5 grams of curcumin twice a day (3 grams per day of curcumin) or placebo for one month with continued mesalamine treatment. At week four, none of the patients who received placebo achieved remission, while a startling 53.8% of those receiving curcumin did. The curcumin used was Cur-Cure™ (Bara Herbs, Israel), a 95% pure curcumin preparation (Lang, Clin Gatroenterol Hepatol 2015). A study among 56 men and women in Iran with mild to moderate ulcerative colitis found that 80 mg of an enhanced-bioavailability "nanoparticle" formulation of curcumin (similar to Theracurmin) taken three times daily (240 mg per day) in addition to mesalamine for one month modestly decreased urgency of bowel movements and improved self-reported well-being, but did not decrease blood in the stool or colitis-related skin ulcers compared to mesalamine alone (Masoodi, J Cell Biochem 2018). One gram of curcumin taken twice daily in addition to mesalamine or sulfasalazine for six months helped maintain remission from ulcerative colitis compared to standard medications plus placebo (Hanai, Clin Gastroenterol Hepatol 2006), but a lower dose (450 mg of curcumin daily) did not improve remission rates or improve mucosal healing compared to placebo in men and women with active ulcerative colitis taking mesalamine (Kedia, World J Gastrointest Pharmacol Ther 2017). A very small pilot study suggests a benefit with curcumin in treating ulcerative proctitis and Crohn's disease (Holt, Digestive Diseases and Sciences 2005). The results of human studies using turmeric for treating gastric or duodenal ulcers conflict. At least two studies found no benefit while a third found that turmeric improved symptoms. Additionally, while some animal research suggests that turmeric might help prevent ulcers, other animal research suggests that turmeric might increase the risk of ulcers. A preliminary study in five people with familial adenomatous polyposis (a genetic disorder causing hundreds of intestinal polyps and eventually colorectal cancer) suggested that curcumin might cause regression of polyps in such people, and such is the case with other non-steroidal anti-inflammatory drugs. However, a 12-month clinical study in which patients were given 1,500 mg of pure curcumin twice daily or a placebo found no significant difference in the mean number of polyps or polyp size between the two groups. Possibly explaining the different outcomes of the studies, the researchers noted the earlier, positive, study used a lower total dose of curcumin (480 mg given three times daily) but it included black pepper extract to increase bioavailability as well as quercetin (20 mg per dose) (Cruz-Correa, Gastroenterology 2018). Curcumin can help treat symptoms of rheumatoid arthritis -- although it is not superior to non-steroidal anti-inflammatory drugs. As noted in a meta-analysis of several clinical studies, there is compelling evidence that curcumin (about 1,000 mg per day) can be effective in treating symptoms (mainly pain and inflammation) of osteoarthritis and rheumatoid arthritis, although larger studies are needed to confirm these findings before a definitive recommendation can be made (Daily, J Med Food 2016). More details regarding the use of curcumin in each type of arthritis are below. A small, 90-day study in India found a highly bioavailable formulation of curcumin to greatly reduce pain and inflammation in people with rheumatoid arthritis. Twice-a-day after meals, patients took a placebo or 250 mg or 500 mg of the curcumin formula (AcuminTM also called Cureit, from Aurea Biolabs, India, which is 50% curcuminoids and, apparently, 10 times more bioavailable than regular curcumin) (Amalraj, J Med Food 2017). Although improvements were noted in biochemical markers of inflammation relative to placebo, it was not mentioned whether the improvements in symptoms were statistically significant relative to placebo: Due to small sample sizes in the study, they may not have been. This, and the fact that most of the study authors were employed by the product manufacturer, raise doubts about the importance of the findings. (This ingredient does not appear to be in any of the products tested in the Review, below). A small placebo-controlled study of people with mild to moderate osteoarthritis of the knee found treatment with curcuminoids to be helpful. Six weeks of daily treatment with 1,500 mg of a curcuminoid complex resulted in significantly greater reductions in the severity of osteoarthritis symptoms than with placebo, with a particular reduction in pain and an improvement in physical function. Reports of stiffness were reduced in both the treatment and placebo groups, although not significantly more so in the treatment group (Panahi, Phytother Res 2014). Those receiving curcumin were able to reduce their use of anti-inflammatory drugs by 84% during the study -- significantly more than the 19% reduction among those in the placebo group. The curcumin used in the study was taken three times each day as a capsule containing 500 mg of curcuminoids as C3 complex® including 5 mg of Bioperine®, a bioavailability enhancer. This ingredient, C3 complex®, is found in two products listed below in this review: Doctor's Best High Absorption Curcumin and Nutrigold Turmeric Curcumin Gold, although the concentration of Bioperine® is lower in these products (2.5 mg rather than 5 mg per 500 mg of C3 complex®). The BCM-95 version of curcumin (taken as 500 mg capsules of CuraMed, each with 333 mg curcuminoids, as in Terry Naturally CuraMed and other products in this Review) was also found to modestly reduce pain-related symptoms of knee osteoarthritis as compared to placebo (which also showed improvement) in a 12-week study in Armenia, although it was somewhat more effective in improving physical performance when taken combined with a Boswellia extract (as Curamin — 350 mg curcuminoids and 140 mg boswellic acid, not tested in this Review, but found in Terry Naturally Curamin). The capsules were taken three times a day (Haroyan, BMC Compl Alt Med 2018). There is only slight additional benefit to taking curcumin along with an anti-inflammatory drug for osteoarthritis. A study evaluated the effect of daily curcumin (500 mg of a 95% curcuminoid extract) or a placebo (talc) in patients also given the anti-inflammatory drug diclofenac (50 mg/day) and omeprazole (20 mg/day, given to reduce gastric side effects of diclofenac). Not surprisingly, at two months both groups reported major improvements in joint pain, stiffness and function, but the curcumin group showed only slightly better improvement in pain and function, e.g., the pain score fell from 15 to 9.5 in the curcumin group and from 15 to 10.2 in the placebo group. The curcumin group had greater decreases in markers of oxidative stress, but not in levels of IL-1 beta, a marker of inflammation. Neither group showed knee joint improvements on X-ray. (Srivastava, Inflammopharmacol 2016). Although most arthritis studies have focused on curcumin, one study suggested that other constituents in turmeric may have a role. This study used a turmeric extract (NR-INF-02 "Turmacin®," Natural Remedies, India, 500 mg twice daily) which contained turmeric polysaccharides but no curcumin. The extract was found to perform better than placebo and better than chondroitin sulfate among people with osteoarthritis (Madhu, Inflammopharm 2013). Several studies have evaluated formulations of curcumin on muscle function, recovery, and soreness after exercise. Although some studies report a benefit, others have not and the usefulness of curcumin in muscle recovery and soreness remains questionable. At best, if taken for a few days before intense exercise, curcumin may slightly reduce resulting inflammation and, if begun after exercise, it may reduce muscle damage and soreness. A small, placebo-controlled study in young healthy men found that 90 mg of a bioavailability-enhanced curcumin formula (Theracurmin, from Theravalues Corp., which funded the study) taken with breakfast and dinner for seven days before a single intense session of eccentric resistance arm exercise slightly reduced one blood marker of inflammation 12 hours after exercise, but did not decrease muscle soreness or improve recovery compared to placebo at any time during the seven days after exercise. However, when the same dose of curcumin was taken for seven days after the exercise session, a significant reduction in muscle soreness as well as improved muscle strength and range of motion were observed starting about 3 to 6 days after the exercise session. Taken after exercise, curcumin also reduced blood levels of creatine kinase (a marker of muscle damage), but did not reduce markers of inflammation (Tanabe, Scand J Med Sci Sports 2018). Other studies that have suggested a benefit include two that used a bioavailability-enhanced curcumin, Meriva: One gave 20 healthy young men 200 mg of curcumin (from 1 gram of Meriva) at breakfast and dinner for four days; they experienced significantly less soreness in their front thighs 48 hours after intense treadmill exercise (on the third day of treatment) than men given placebo (Drobnic, JISSN 2014). The other involved 50 young male rugby players with muscle and/or joint pain due to overuse or injury who were given Algocur (containing 1 gram of Meriva) or traditional anti-inflammatory medication for up to 10 days. Both groups reported similar decreases in self-reported pain and improvements in physical function. However, it is not possible to draw conclusions from this study because there was no placebo-control and those taking curcumin were permitted to take anti-inflammatory drugs as needed (Di Pierro, Eur Rev Med Pharmacol Sci 2017). Another small, placebo-controlled study in young healthy men found that 2,500 mg of curcumin taken twice daily (a total daily dose of 5,000 mg providing roughly an equivalent amount of curcuminoids) 2 days prior to, and 3 days after, intense leg exercise moderately reduced leg pain during subsequent exercise (24 and 48 hours later), indicating a reduction in delayed onset muscle soreness (DOMS). Effects on biochemical markers of inflammation, however, were inconclusive (Nicol, Eur J Appl Physiol 2015). A small study among healthy young men and women given 200 mg of curcuminoids (from 1 gram of CurcuWIN) daily for two months showed significantly reduced thigh muscle soreness 24 hours after muscle damaging exercise compared to placebo; however, there was no significant reduction in soreness one hour after exercise, nor 2 and 3 days after exercise, compared to placebo. The curcuminoids reduced a marker of muscle damage (creatine kinase) two days after the exercise, but did not reduce other markers of inflammation, compared to placebo. A lower dose (50 mg of curcuminoids from 250 mg CurcuWIN) reduced muscle damage, but did not significantly decrease soreness (Jager, FASB J 2017). 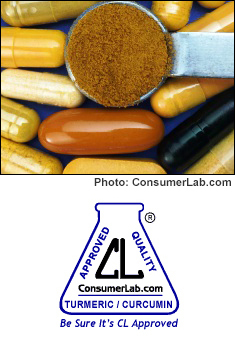 Studies which failed to show a benefit include one in which a daily dose of 400 mg of a curcumin formula containing 80 mg curcumin plus fats to enhance absorption (Longvida® Optimized Curcumin) was given to healthy young men and women for two days before and four days after leg press exercises (designed to induce muscle damage). The curcumin did not reduce muscle soreness compared to placebo, but it did result in somewhat smaller increases in biological markers of inflammation (McFarlin, BBA Clinical 2016). A more recent, placebo-controlled study in France gave athletes 6,000 mg of curcumin plus 60 mg of the bioavailability enhancer piperine daily (divided into 3 doses) for two days before and after exercise-induced muscle damage. The curcumin did not limit muscle damage or soreness and only limited loss of power in one of several exercises (sprinting) (Delecroix, J Sports Sci Med 2017). Curcumin has shown some short-term beneficial effects on cognition (thinking and memory) but longer-term studies have shown mixed results. A small, but well-controlled study found that daily supplementation after breakfast with 400 mg of a patented curcumin formula containing 80 mg curcumin plus fats to enhance absorption (Longvida® Optimized Curcumin — Longvida funded the study) significantly improved some aspects of cognitive function and fatigue in healthy men and women ages 60 to 85. One hour after ingestion of the first dose, scores on a subtraction test improved by 16%, which was significantly more than the 2% increase with placebo; however; the effect was brief — when the subjects were retested 3 hours later no benefit was found. After 4 weeks of daily supplementation at the same dose, scores among those taking curcumin improved by 17% (vs. 3% with placebo) and fatigue was reduced by 11% (vs. 4 % with placebo). While these results are intriguing, it must be noted that no benefits were found on tests of word and picture recall (Cox, J Psychopharm 2014). However, a longer study funded by the U.S. NIH using a much higher dose of the same curcumin formula did not find benefit. In the study, 39 healthy men and women ages 45 to 74 took 2,000 mg of Longvida providing 400 mg of curcumin every morning on an empty stomach for three months; there was no significant improvement on measures of cognitive function, fatigue, or motor function such as hand grip, knee strength, walking/mobility, compared to placebo. It should be noted that, unlike the earlier study, Longvida was taken without food, which may have reduced its absorption — although Longvida is made with fats claimed to improve its absorption (Santos-Parker, Nutr Healthy Aging 2018). Another small, but placebo-controlled study found that taking a capsule with 1,000 mg of turmeric powder (about 1/4 teaspoon) with a nutritionally-bland breakfast resulted in improvements in short-term memory in people aged 60 years or older who were newly diagnosed with pre-diabetes. When tested six hours after taking the turmeric, scores were 2.9 (out of a possible 3.0) on a test to recall numbers in sequence, compared to 2.6 prior to turmeric. Scores did not improve among those who received placebo. Interestingly, turmeric had no effect on blood sugar or insulin levels. The study also evaluated the effects of taking 2 grams of cinnamon, which had no effect on any of the parameters measured (Lee, Asia Pac J Nutr 2014). A long-term study in Australia among older adults (mainly in their 60s) with normal cognitive function found that taking high-dose curcumin daily had no beneficial effect on cognitive function, nor on mood or general quality of life, compared to treatment with placebo over a 12-month period. The curcumin used was BCM-95 CG (Biocurcumax — 88% total curcuminoids) given as a 500 mg capsule taken 3 times a day after meals with water. A fairly high percentage (26%) of those taking curcumin withdrew from the study due to side effects — most of which were gastrointestinal in nature, compared to only 4% of those taking placebo. According to the researchers, the rate of side-effects would likely have been lower had the dose been gradually ramped-up rather given at the full amount at the beginning of the study (Rainey-Smith, Br J Nutr 2016). A double-blind study among 40 older adults with normal cognition or mild cognitive impairment found that taking 90 mg of an enhanced bioavailability curcumin formula (Theracurmin, which is 30% curcumin, from Theravalues Corp. which funded the study) twice daily for 18 months modestly improved measures of short-term memory, verbal memory and attention compared to placebo. About 19% of participants in the curcumin group reported gastrointestinal side effects (transient abdominal pain, gastritis, or nausea) compared to 10.5% of those in the placebo group. Those in the placebo group showed slight increases (on PET scans) in amyloid beta plaque and tau tangles in the hypothalamus and these increases were not found in the curcumin group, but no other significant differences between the groups were found in other parts of the brain. Although such changes are associated with Alzheimer's disease, the value of these findings is unclear (Small, Am J Geriatr Psychiatry 2017). Several authors of the study have a financial interest in a tracer agent used in the PET scan and have been warned by the FDA for claiming it can be used to diagnose neurological conditions. Laboratory and animal studies have shown curcumin inhibits several biological and chemical processes in brain cells associated with the development of Alzheimer's disease, including inflammation, oxidative stress and the formation and accumulation of amyloid-beta proteins (which form brain plaques associated with Alzheimer's). Animal studies also suggest curcumin may work similarly to acetylcholinesterase inhibitors, a class of drugs (such as donepezil (Aricept) and galantamine (Razadyne)) that may slow the progression of Alzheimer's symptoms. In mouse models of the disease, curcumin given orally appears to reach the brain and reduce oxidative damage and memory impairment (Frautschy, Neurobiol Aging 2001). However, results have been less promising in clinical trials of curcumin in people with Alzheimer's. For example, a preliminary study found that curcumin given to Alzheimer's disease patients did not significantly improve mental functioning compared to placebo (Baum, J Clin Psychopharm 2008). Another study in people with mild to moderate Alzheimer's found that curcumin did not improve cognitive function or decrease amyloid-beta (as measured in cerebrospinal fluid) compared to placebo (Ringman, Alzheimers Res Ther 2012). Curcumin (100 mg of curcumin from turmeric powder capsules) taken daily for three months has been reported to reduce agitation, anxiety and irritability in three people with severe Alzheimer's disease who were also taking an acetylcholinesterase inhibitor (Nozomi, Ayu 2012). In a review of the evidence for curcumin and Alzheimer's disease, the researchers concluded that, to date, studies in people "have not been able to generate the anticipated benefits of curcumin," noting that this may be due, in part, to the low bioavailability and absorption of curcumin and the severity of disease progression in the people who participated (Goozee, Br J Nutr 2015). Curcumin may help treat depression, although effects may take two to three months. A small but controlled, 8-week study among people with major depression found partial support for antidepressant and anti-anxiety effects of curcumin. Patients received either placebo or curcumin (500 mg of BCM-95) twice daily and remained on pharmaceutical antidepressants during the study. At four weeks into treatment, depressive symptoms had improved equally for both groups, but from weeks 4 to 8 curcumin was significantly more effective than placebo in improving depressive symptoms. Greater efficacy was noted among individuals with atypical depression. One of the ways curcumin may affect depression, according to the researchers, is through an immune-inflammatory pathway (Lopresti, J Affect Disorders 2014). A larger, more recent study among people with major depression (about half of whom were taking a prescription antidepressant) found that a lower dose (250 mg twice daily) of BCM-95 taken for three months significantly reduced symptoms of depression, as well as anxiety, compared to placebo, and was as effective as the higher dose of 500 mg twice daily (Lopresti, J Affect Disorders 2016). As in the previous study, curcumin's effects became significant compared to placebo after the first 4 weeks, and greater efficacy was found in those with atypical depression. In addition, a study in Thailand showed that curcumin supplementation was more effective than placebo in improving symptoms of depression in adults who were already taking an antidepressant (fluoxetine (Prozac), sertraline (Zoloft), trazodone (Desyrel) or mianserin (Tolvon)). The curcumin was given as a capsule containing 250 mg curcuminoids (192.5 mg of curcumin, 42.5 mg of demethoxycurcumin and 15 mg of bisdemethoxycurcumin) taken twice daily (before breakfast and dinner) for the first week. The dose was increased by 250 mg per week for three weeks, and then maintained at a dose of 1,500 mg per day for eight more weeks. Compared to placebo, significant improvements in symptoms of depression occurred 12 weeks after beginning supplementation with curcumin (Kanchanatawan, Neurotox Res 2018). A review of 11 randomized, placebo-controlled studies among adults with conditions such as pre-diabetes, obesity, metabolic syndrome, or non-alcoholic fatty acid liver disease concluded that curcumin had a modest but significant effect in reducing body weight and BMI (body mass index). On average, study participants lost 2.5 lbs. of bodyweight, based on studies tending to be 3 to 12 weeks in duration. Curcumin was also found to reduce waist circumference (by about 1 to 1.5 inches), but only in people who were overweight taking at least 1,000 mg per day of curcumin for at least eight weeks (Mousavi, Crit Rev Food Sci Nutr 2018). A small study in Brazil among children and adolescents with persistent asthma of generally moderate severity who were taking traditional asthma medications found that daily supplementation with curcumin for six months decreased nighttime awakenings and use of short-acting inhalers, and improved disease control compared to traditional treatment plus a placebo. The curcumin was given twice daily in capsules; each capsule contained 250 mg of root powder (including 11 mg of curcumin and 2 mg of demethoxycurcumin) and the daily dose for each child varied by weight (about 30 mg per kg of bodyweight per day). Approximate daily dosages by age were: 500 mg powder (20 mg curcuminoids) (7 - 10 yrs); 750 mg powder (30 mg curcuminoids (11 - 14 yrs), and 1,000 mg powder (40 mg curcuminoids) (15 - 18 yrs) (Manarin, J Ethnopharmacol 2019). A pilot study suggests that curcumin can reduce nasal symptoms associated with seasonal allergy (allergic rhinitis). In this study, more than 200 people in China with a history of seasonal allergy took capsules containing 500 mg of curcumin (ORGANIKA Health Products, Canada) or a placebo (colored starch) daily for two months. Over this period there were significant improvements in sneezing, runny nose, and nasal congestion among those given curcumin, with the average total symptom score falling from 8 (out of a possible 12) down to 2.8, while there were no significant changes in the placebo group. Curcumin was also found to affect levels of certain inflammatory mediators, including decreases in interleukin-4 and TNF-alpha (Wu, Ann Allergy Asthma Immunol 2016). Although preliminary studies suggest that curcumin may help people with chronic anterior uveitis (an autoimmune disease of the eye that causes symptoms such as redness, pain, light sensitivity and blurred vision), this has not been proven in a well-controlled study. For example, a study in Italy found that a tablet containing 600 mg of Meriva taken twice daily in addition to standard treatments (steroids, immune-suppressants, and/or eye drops) reduced symptoms of eye discomfort within 4 to 6 weeks and, after one year, 42% of patients reported reductions symptoms such as eye pain, blurring of vision and redness. The average number of relapses decreased from 275 per year prior to supplementation to 36 during supplementation. However, there was no placebo group, so conclusions cannot be drawn from this study. The researchers noted that the results suggest curcumin might be beneficial for other inflammatory eye conditions such as dry eye (Pia, Clin Ophthalmol 2010). Laboratory and animal studies also suggest a potential benefit for dry eye but, there are no published efficacy studies in people. [Note: Interestingly, a CL member reported experiencing dry eye with taking Meriva]. There are anecdotal reports of curcumin being given to treat psoriasis, an autoimmune disease. However, a clinical trial with a curcuminoid complex showed a low response rate (Kurd, J Am Acad Dermatol, 2008). There is mixed evidence on whether turmeric and curcumin can lower cholesterol. A review of studies of people at risk for cardiovascular disease indicated that turmeric and curcumin can lead to modest improvements by lowering elevated LDL "bad" cholesterol and triglycerides -- although they do not help raise HDL "good" cholesterol or lower total cholesterol levels. Curcumin formulations with enhanced bioavailability seemed to be more effective than turmeric powder, particularly with regard to lowering triglycerides (the review did not identify ideal dosage or formulations) (Qin, Nutr J 2017). An earlier review failed to find a beneficial effect on cholesterol levels from turmeric or curcumin, although that review did not include studies of products with enhanced bioavailability (Sahebkar, Clin Nutr 2014). A study in Australia among older adults with high cholesterol levels (averaging 254 mg/dL total cholesterol and 169 mg/dL LDL) found that adding 1,000 mg of bioavailability-enhanced curcumin (Meriva -- providing 200 mg of curcumin) each day to 25 grams of a phytosterol-enriched fat spread (Logicol Original -- providing 2 grams of phytosterols) daily for one month resulted in average decreases in total and LDL cholesterol of 11% and 14.4%, respectively, as compared with decreases of 4.8% and 8.1% with only the phytosterol. Those who took only the curcumin had slight but non-significant decreases in total or LDL cholesterol (Ferguson, Metabolism 2017). Curcumin has been shown to suppress proliferation of a wide variety of cancer cell types in the laboratory. In addition, a study of 64 adult smokers found that taking 4 grams of curcumin for 30 days reduced the number of aberrant crypt foci (an early change in the colon that might lead to colon cancer) by 39%. Test results indicated that this activity was achieved via absorption and circulation of curcumin through the blood stream, rather than direct effects of curcumin in the colon (Carroll, Cancer Prev Res Phila 2011). However, results of a small study of patients with pancreatic cancer given 8 grams of curcumin daily showed biological activity in only about 10% of patients (Dhillon, Clin Cancer Res 2008). In a small study in people with myeloma (a bone marrow cancer of white blood cells), 4 and 8 grams of curcumin daily for up to one year significantly reduced levels of certain inflammatory markers (such as COX-2) and a protein that promotes myeloma tumor growth (NF-kB), although it did not result in clinical improvements (Vadhan-Raj, Blood 2007). However, it was more recently reported that a 57 year-old woman with stage 3 myeloma who was no longer responding to traditional treatment began taking a daily dose of 8 g of curcumin with bioperine (dose not given) and once-weekly hyperbaric oxygen therapy and, during the next five years (up until the publication of the report), her myeloma remained stable with blood cell counts returning to normal range and maintaining a good quality of life (Zaidi, BMJ Case Reports 2017). Taking curcumin with a meal can minimize the increase in blood sugar and insulin levels that occurs after eating. A small study in Australia among 15 healthy young men and women (average age 26) found that taking 180 mg of curcumin (from two tablets of the bioavailability-enhanced curcumin formulation Meriva) immediately before consuming breakfast (toast, peanut butter and chocolate milk, providing 56 g carbohydrate, 22 g fat and 21 g protein) reduced the increase in blood sugar and insulin levels one hour after the meal by 61% and 26%, respectively, compared to placebo. Interestingly, taking the same amount of curcumin with fish oil (1.2 grams of fish oil providing a total of 240 mg EPA + 860 mg DHA) had the same effect on insulin levels as curcumin alone but slightly blunted curcumin's effect on blood sugar (Thota, Sci Rep 2018). Preliminary research shows that, taken over a longer period of time, curcumin may lower the chances of prediabetes (blood sugar levels somewhat higher than normal) advancing to actual diabetes. A study of middle-aged, slightly overweight individuals in Thailand (Chuengsamarn, Diabetes Care 2012) found that over nine months, none of the 97 subjects randomized to daily treatment with curcumin (1.5 grams of curcuminoids/day in 2 divided doses) became diabetic, but 19 of 104 subjects receiving a placebo did. Curcumin appeared to boost activity of the insulin-secreting cells in the pancreas. More research is needed to confirm these results in other populations. One small clinical study in healthy, sedentary postmenopausal women found that a daily dose of 150 mg (from six 25 mg pills) of a branded curcumin ingredient (Theracurmin, Theravalues Corporation), taken for 2 months significantly lowered systolic blood pressure, but not diastolic blood pressure, compared to placebo. (Akazawa, Nutr Res 2012). The decrease in systolic blood pressure (about 5 points) was similar to that measured in women who did not take curcumin but participated in an aerobic exercise program at least 3 days per week for the duration of the study. The study does not note whether the six pills were taken together or divided throughout the day, or if they were taken with food. Curcumin has also been found to reduce systolic blood pressure in lupus patients with kidney nephritis (inflammation) taking corticosteroid and/or anti-hypertensive medications. A dose of 500 mg of turmeric (containing 22.1 mg curcumin) taken with each meal (a total daily dose of 66.3 mg curcumin) was found to significantly reduce systolic blood pressure after 3 months compared to placebo (Khajehdehi, J Renal Nutr 2012). Although animal studies suggest that high doses of curcumin for a long period of time might be harmful to the liver, short-term studies in people with moderate daily doses of curcumin (< 500 mg) have not indicated a problem (Kedia, World J Gastrointest Pharmacol Ther 2017; Khajehdehi, J Renal Nutr 2012); however, there are no long-term safety studies on the effects of curcumin supplementation on liver health. In people with non-alcoholic fatty liver disease (NAFLD), two short-term studies in Iran found that supplementation for two months with enhanced bioavailability curcumin formulations providing 70 mg to 100 mg of curcumin daily improved liver health, significantly lowering levels of certain liver enzymes (ALT and AST) and reducing liver size and/or liver fat content compared to placebo (Rahmani, Phytother Res 2016; Panahi, Drug Res (Stuttg) 2017). A review of preclinical research and studies in people concluded that the evidence that curcumin may help to treat people with certain liver diseases is "promising" but limited, and that further studies, particularly long-term studies, are needed (Hu, Ann Hepatol 2017). Bear in mind that some animal studies have shown liver toxicity with large doses of curcumin over prolonged periods of time (Kandarkar, Indian J Exp Biol 1998) while others have found curcumin to help prevent liver damage (Bruck, Liver Int 2007; Chuang, Food Chem Toxicol 2000). A small study in dogs indicated that curcumin (4 mg/kg of body weight) taken twice daily could beneficially affect biochemical pathways associated with decreasing inflammation and pain and improving function in dogs with osteoarthritis; however, due to the size of the study, no conclusions could be drawn (Colitti, Vet Immunol Immunopathol 2012). The curcumin used in the study (Curcuvet, Indena) is a phytosomal formula containing 18-22% curcuminoids made by the makers of Meriva (which is also found in some joint supplements for pets, as well as for people). Curcumin as BCM-95 has been shown to reduce certain markers of chronic low-grade inflammation in obese cats (Leray, Br J Nutr 2011), but there are no studies of its effects in cats with osteoarthritis. Recommended dosing of curcumin for dogs ranges from 50 mg to 250 mg three times daily (depending on the size of the animal) or ½ teaspoon daily of whole turmeric twice daily, and, for cats, 50 mg to 100 mg daily or ¼ teaspoon daily of whole turmeric (Wynn, Veterinary Herbal Medicine 2007). Be aware that polysorbate 80, which may be included in some curcumin formulations for people (such as Longvida), can cause severe allergic reactions in some dogs (Comblain, J Vet Pharmacol Ther 2016). However, no adverse effects were reported in dogs when black pepper extract, a bioavailability enhancer, was added to a food formulation containing curcumin and other ingredients (Head, J Alzheimers Dis 2012); there do not appear to be such safety studies cats. Unpleasant body odor in dogs taking curcumin has been reported (Dejonckheere, British Association of Veterinary Herbalists 2016). In addition, as with people, turmeric/curcumin should be avoided in dogs and cats taking certain medications or with certain medical conditions (see Concerns and Cautions). Additional clinical studies of turmeric and curcumin in a variety of diseases are ongoing. More information about the clinical evidence for turmeric is available in the Encyclopedia article on this site. Labeled Amount Does the product really contain the expected amount of turmeric or curcuminoid compounds? Purity Does the product contain contaminants? Like other supplements made from plant roots, turmeric may be contaminated with heavy metals, such as lead, cadmium and arsenic -- although such contamination is much more likely to occur in products made from whole turmeric root rather than extracts. In children, infants, and fetuses, even low levels of lead can adversely affect neurobehavioral development and cognitive function. In adults, lead at somewhat higher levels can cause elevated blood pressure, anemia, and adversely affect the nervous and reproductive systems. Lead is of particular concern during pregnancy as the mother can transfer it to the fetus. Cadmium is a carcinogen and kidney toxin. Arsenic is a carcinogen and can damage organs. Ability to Break Apart Properly Once in your body, will the pill break down properly (disintegrate) so that it can release its contents? ConsumerLab.com, as part of its mission to independently evaluate products that affect health, wellness, and nutrition, purchased many turmeric or curcumin supplements sold in the U.S. and Canada and tested them to determine whether they 1) possessed the claimed and minimum expected amount of curcuminoid compounds, 2) were free of unacceptable levels of lead, cadmium, and arsenic if listing whole turmeric root or over 250 mg of mineral ingredients, and 3) if regular tablets, could disintegrate properly in order to release their contents for absorption (see Testing Methods and Passing Score). Interestingly, an analysis by the University of Arizona in Tucson of 87 turmeric/curcumin supplements purchased in early 2017 from local retailers yielded results similar to those found by ConsumerLab over the years: Most products contained the curcumin expected from labels. Heavy metal contamination above 0.5 ppb (0.5 mcg per gram) was noted in only one product -- a turmeric root powder, but not in any extracts. Although traces of solvents (which are used to make extracts) were found in most products, none exceeded USP limits (Skiba, Mol Nutr Food Res 2018). These findings support ConsumerLab's allocation of testing of herbal supplements: All products are tested for key compounds; all herb powders are tested for heavy metals; and solvent testing is generally not performed. Turmeric and Curcumin Supplements and Spices Review!